Here are the winners in our "Clever Ways to Use Cook'n 11" contest for the month of February (along with their winning suggestions). Newsletter subscribers and avid Cook'n 11 users, Linda D. and Terrellgram, each win a copy of my best-selling cookbook, Everyday Gourmet as our way of saying "Thank you for your enthusiastic support and love of our product." 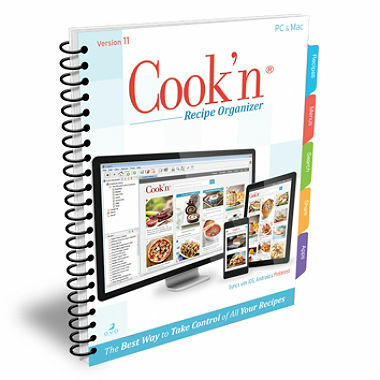 See if you don't find these ideas spark your creativity in using the amazing Cook'n 11 recipe organizer! So play around with this almost limitless software and come up with yet another clever way to use Cook'n 11. 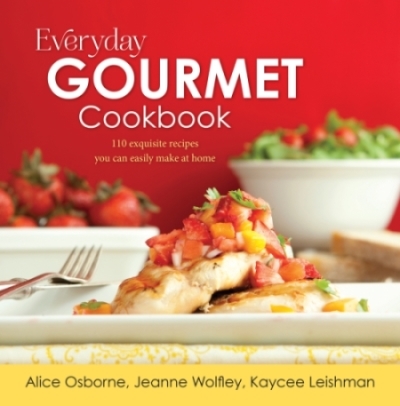 We'll watch for your suggestions as we look for a March winner—we'll give away another copy of Everyday Gourmet! The next winner with yet another excellent idea(s) to be announced the first part of April. Rather than taping recipes to my canisters, I am starting to scan recipes found on product packaging that I use a lot, into my Cook'n software. I've created a "Package Recipes" chapter, and this way I don't have to worry about tape on my canisters. Also, regarding Categories—"Package and Product Recipes and Directions:" To make my recipe searches even faster, I've added *** to the front of my absolute favorite go-to recipes. These are the ones I don't make often enough to memorize, but are so good that they need repeating as often as the "MOM, we had that twice last week!" will allow. That way, I search for *** in My Favorites cookbook and it brings them all up. By the way, I also have a Crafts chapter (which I will make into a separate 'book' to add chapters like Quilts, Paper Crafts, Sewing and Sewing Tips. In the Crafts chapter so far, I have the "recipe" for a lovely strip quilt with photo that I want to make "in my spare time", lol. The "ingredients" are the fabrics, numbers of strips needed, and in which color and size the strips are. In order to keep Cook'n less confused, I only used the Ingredient Info fields to enter the information. I open Cook'n usually at least once a day to find items and ideas for our meals. I have cookbooks I have made that have recipes added to them from the books included with many appliances such as my grills, deep fryer, slow cooker, etc. The chapters are the titles/names of the appliance. I also open up the weekly sale paper for our grocery store and do a search for recipes using the fruits, veggies, and meats that are on sale that week. These recipes become our weekly menu and saves a bundle. I have been thinking of making a cookbook of "Seasonal Favorites" and adding chapters named after the seasons. Recipes we love to prepare for those times can be put in the proper season. I had not thought of adding a crafts section but do have a section for homemade soaps, lotions, etc. And chapters for tips, conversions, substitutions, etc. I also have a list in one cookbook of links to sites that sell spices, cooking apparatus, etc. online.